The Missing Peace: Artists Consider the Dalai Lama at the Yerba Buena Center for the Arts. A community-created meditation and mosaic of photos and words. The game ran January thru March, 2008. Listen/watch as Sky talks with Joel Tan, head of community engagement at YBCA, about Making Peace and its role in a museum and exhibition environment. This game was inspired by The Missing Peace and was played while the exhibition was at YBCA. 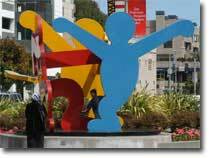 ...a community-involvement project for the Yerba Buena Center for the Arts. An LGBT community-created gallery based on the Gran Fury SILENCE=DEATH call to awakening from 1989. Active during October and November 2009. The game was seeded in advance with a number of images, played over time, and combined with other activities at a late-night party at YBCA. You can visit the web site. ...a community-involvement exercise for the Yerba Buena Center for the Arts. 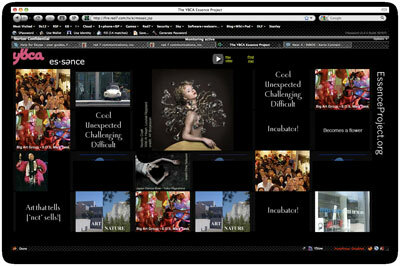 The idea was to engage the community in envisioning the essence of YBCA. The activity ran in 2009. This was our first time integrating video segments from participants into the mosaic. The game used the YouTube API to provide custom playback of sequences of videos from participants without the regular YouTube commercials and suggested videos at the end. This activity is no longer available online. ...at the Yerba Buena Center. If you had 30 to 45 minutes in 2008 and could get to the Moscone Center in San Francisco, you could have played this real-life game. San Francisco, CA: To start the game, send the TEXT message YBC to art@red7.com from your mobile device. You'll receive your first instructions within a minute. Today you can download this PDF containing details even though you can’t play in real life. ...a New Year's Eve game. 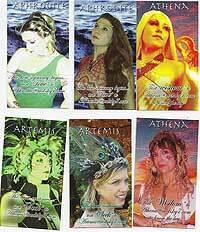 These two games used in-party characters (representing the goddesses Aphrodite, Athena, and Artemis, who gave out “clue cards” (the size of business cards) that gave the players their next assignment. Each assignment involved shooting a photo and sending it back, plus locating the next “goddess” at the party. The game was kicked off at the entrance door by the Oracle, who handed out the first goddess card and explained how to get started. Conceptualization of the game, and recruitment of the goddesses was carried out by Mark (Spoonman) Petrakis as a part of his pARTy Science gig. This was a Powered by Red7 game. We learned that 1) if it’s too noisy, it’s hard for anyone to play; 2) if people drink too much they don’t play; and 3) there are other fun things to do at most parties. And the more crowded the venue, the harder it is (believe it or not) to find even a goddess! ...integrated the multi-step “game” with the goal of telling your own story about happiness. This was the first time we tried promoting the game using photo postcards to get people interested. It was created for Project Happiness. 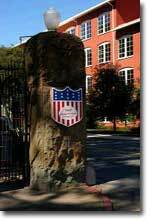 The Presidio of San Francisco, which was part of the Spanish colonial empire for 75 years before the California gold rush brought it to US statehood, is loaded with historic sites and information. Take a 2-mile walk (or bike ride) starting at George Lucas' new media complex and spanning 230 years of history. This is the largest urban national park in the United States. San Francisco, CA: This game is no longer available and involves telephone call-ins that have been discontinued. If you wish, you can download a PDF containing a photo tour (with "answers")[8mb], even if you're not in San Francisco. Start at the Smithsonian Institution “Castle” and walk the National Mall to the Capitol and back—you'll find there is an incredible wealth of public art. And we'll show you some neat stuff you might otherwise miss. Washington, DC: This game is no longer available and involves telephone call-ins that have been discontinued. 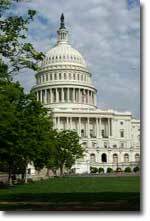 If you wish, you can download a PDF containing a photo tour (with "answers") [6mb], even if you're not in Washington DC . A one-time game for Future Commons participants at the Institute for the Future. The “screenplay” from which we developed the game (it was group-developed). Wiki has been kidnapped. Your task is to recover Wiki in the next 45 minutes, or he will be executed! The hunt involved finding five “artifacts” in real life, associating each one with a letter of the alphabet, and then arranging the letters to spell a common word that gave a final clue about how to intercept Wiki's kidnapper. The first clue, calling the phone message, sent the group to the Palo Alto Daily newspaper rack, which is red, consequently the first letter was “R”. Within the newspaper was a classified add titled "WIKI" which gave the next clue. Participants went to a movie theater, ice cream parlor and local park to retrieve the five letters. One of the clues was "where The Scarlet Letter meets the Spanish Soul, find the well...” - a reference to Alma Street (”soul” in Spanish) and The Scarlet Letter, written by Nathaniel Hawthorne (consequently Hawthorne Street - see Google Street View below to see what's there). Ultimately the letters spelled TRAIN. Combined with the clue that Wiki was last seen at 5:38pm, and with a fake Caltrain surveillance camera ”tape” that we put up online, the players could view the arrival of the 5:38pm train on Friday (see the LOST poster) and see a guy in a red had and overcoat get on the train carrying Wiki himself. Obviously the kidnapper. The final clue took the players to a location where a bicycle messenger wearing a pumpkin on his face and a red was holding Wiki. The messenger was an accomplice who our “inside” team chose at the last minute from some people on the street - our team asked if he would cooperate, and he did. While he was playing the game with us, his bike was stolen! The game involved three “outdoor” teams and one “indoor” team. The outdoor teams did not all solve the puzzles, and one of them jumped to a conclusion without retrieving all of the clues (Kobayashi Maru?). The indoor team was available by phone and had to be consulted to get the answers to certain questions, like the 5:38pm train surveillance camera, in cooperation with the outside teams. It took both teams and clues to solve the puzzle. Here are Mads Rydahl's photos from the playing of the game. 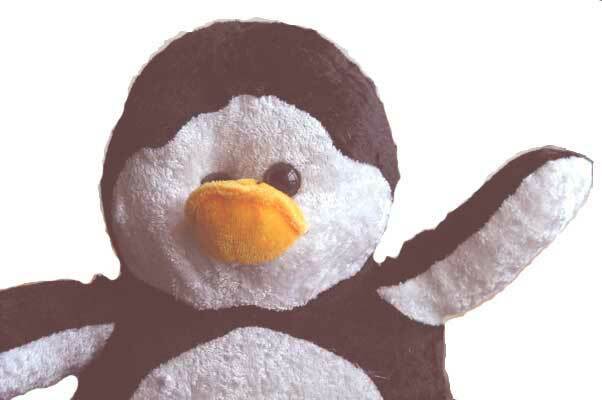 Yes “Wiki” is the name of the stuffed penguin. This game combined email, SMS, online video, and phone calls to illustrate some ethical dilemmas that come up in everyday life. Four teens describe real-life situations and ask for your guidance in solving them. Game archaeology: You can still view the video segments. This game involved sending TXT to start, then receiving messages from “in game” personalities (all are actually sent and received by a game scenario that is completely automated), calling telephone numbers to hear the teens talk, and viewing video online. In preparing the videos, we held each segment to one minute, and the three segments in each case are; 1) the backstory about how the ethical problem developed; then 2) how it became a crisis and what I did about it; and 3) what the lasting result was. From this game we learned that any mixed-reality game really can only consist of 3 to 5 steps or people lose interest. This is where the real work started, and where game became reality. At a business meeting held in Palo Alto in 2002, I got a brainstorm about how mobile phone manufacturers might “teach” customers how to use their new devices by involving them in a mixed-media game where they’d have to use the actual devices and services in order to play the game. The idea was simple—to teach someone how to fully-utilize a voicemail system, you’d engage them in a series of interactions where they’d call in, listen to messages, leave messages, change their greeting, and set up email notifications. 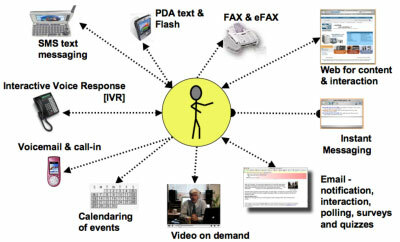 To complete the game, the customer would go around a number of times in a real-life interaction with fictitious characters, all being driven by software-powered scenarios. While I’m pulling together the audio and video for you to view, you can read about the sales scenario in this PDF. 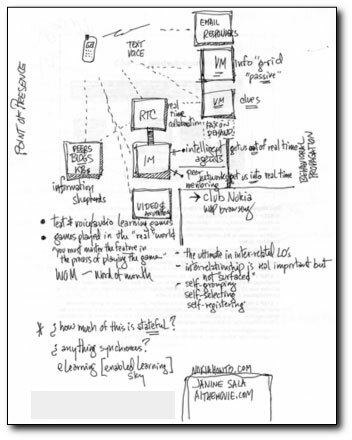 In 2002, I was a discussant for a panel session of the e-learning forum at SRI, and I had been thinking “Let’s break out of our box... how would cellphone users learn about new technologies available to them?” Well the answer was obvious, that the best way to learn would be to use the services themselves, and so I made a sketch showing how various communication technologies could be pieced together to deliver an in-world game that I called a real-world role-playing game (later I took on the term mixed-reality). The process would be coordinated by a computer or server running a scenario. The plan was to involve all of the media (and software) shown in this diagram.